"2 Bulls On The Hill Productions", is an American owned & run French Film & TV Production Company based in Paris, France focusing on International Co- Productions. We are specialized in Production, Film and TV Directing, Line Producing, Film Financing & Sales. We produce a wide variety of quality independent feature films, documentaries, television & formats and act as producers rep. for similar films. We can also serve as a French producing partner for those seeking to do an international co-production with France. We specialize in international co-production and film financing, support, and consulting. We produce a wide variety of quality documentaries, independent feature films, television, and short films. We are seeking International Distribution for completed Feature, Documentary, and Short Films as well as Television series, web series, and Reality TV formats. We are also seeking International Co-Production partners for upcoming projects. We are continually looking for great scripts for production and studios or companies that require and experienced American or French Feature Film Director. Companies that need to arrange a screening for their film in France or the UK. or whom require line producers are also encouraged to contact us. Counter Measures: Unveiling the Global Super State. Currently In Pre-Production, Shooting to begin in the Fall, 2018. This will probably the boldest documentary to be released next year. Director/Writer/Producer Zachary James Miller takes the audience on a journey to a present day heart of darkness, the global surveillance state. Along on this wild ride is Producer, Elizabeth Morgan Hemlock and a team of investigative journalists including New York Times best selling author and award winning reporter, Greg Palast. The film takes a deep revealing look at the world’s most powerful intelligence agencies, their technology, and the past, present, and potential problems when too much power goes unchecked and abuse of power goes unanswered. The film examines life without privacy, drone strikes based on Meta data, the ending of habeas corpus, the culture of constant surveillance and much more. The film in a clear voice states, “What you don’t know will hurt you”. Director/Writer/Producer Zachary James Miller takes the audience on a journey to a present day heart of darkness, the global surveillance state. The film takes a deep revealing look at the world’s most powerful intelligence agencies, their technology, and the past, present, and potential problems when too much power goes unchecked and abuse of power goes unanswered. The film examines life without privacy, drone strikes based on Meta data, the ending of habeas corpus, the culture of constant surveillance and much more. The film in a clear voice states, “What you don’t know will hurt you”. Along on this wild ride is Producer, Elizabeth Morgan Hemlock (Mugabe and the White African) along with a group of international co-producers and a team of investigative journalists including New York Times best selling author and award winning reporter, Greg Palast. The film traces the story of global surveillance, its uses and abuses by the most secret and powerful intelligence agencies on the planet. We'll examine what seems to be a war on investigative journalism and whistle-blowers. We’ll probe the culture of constant surveillance and the intelligence agencies in question; NSA, CIA, FBI, GCHQ, KGB, the 5 Eyes, and others. We'll be looking at aspects of their deadly past, to the equally disturbing present and a potentially terrifying future if allowed to continue without proper oversight. In an effort to get all sides of the story, we will feature conversations with some of the most relevant figures on the issue of spying, privacy, and prevention of terrorism; from political activists, to American and foreign political leaders, to the White House. We will reveal the tools, the technology, and the spy craft that has become pervasive in everyone’s life and seeks to make privacy a thing of the past. This feature length documentary while speaking to many individuals will never be a talking heads documentary. It will look and feel like a fast-paced thriller/spy film as we travel the world of espionage and global surveillance, all the time enlightening as well as entertaining and all the while seeking to give the viewer counter measures to an Orwellian future. In essence, we not only want to highlight the problems but present the solutions. For more information contact us during the Cannes film Festival. Thank You. It is currently on sale via Amazon after its New York theatrical premiere. Foreign territories still available. After Cecile (Deborah Twiss) tragically loses her unborn child, she quits her job, and she, her husband Jonathan (Eric Roberts), and their kids Ariel (Sydney McCann) and Morgan (Matthew McCann) decide to move to the country ... and find a home almost too quickly. Alice (Cathy Moriarty) has lived in this old big country residence for way too long with her bed-ridden mother Sophia (Pat Patterson), and not only can't she afford the maintenance bills anymore, the house also harbors some bad memories, bad memories that have to do with the fact that the relationship between Alice and her mother has become toxic. So when Cecile and Jonathan's car breaks down on their way to doing some house-hunting and they stop by her place to call a tow truck, Sophia is quick to offer them her house for rent ... and since the kids quickly fall in love with the place (especially after Ariel finds a doll on the premises she won't be without anymore), Cecile and Jonathan quickly accept the offer and are quick to move in. A Cry from Within is a haunted house story that's old-fashioned in the best possible way: It takes its time to build up its story, relies on atmosphere and suspense rather than spectacle and effects to bring its story across, and is carried by a subtle directorial effort and a great ensemble cast. Sure, there are many haunted house flicks in today's movie world that are louder, more gruesome, more in-your-face than this one, but this one proves the virtues of good storytelling and fine craftsmanship, which makes it a rather charming piece of horror. Totally worth a look! 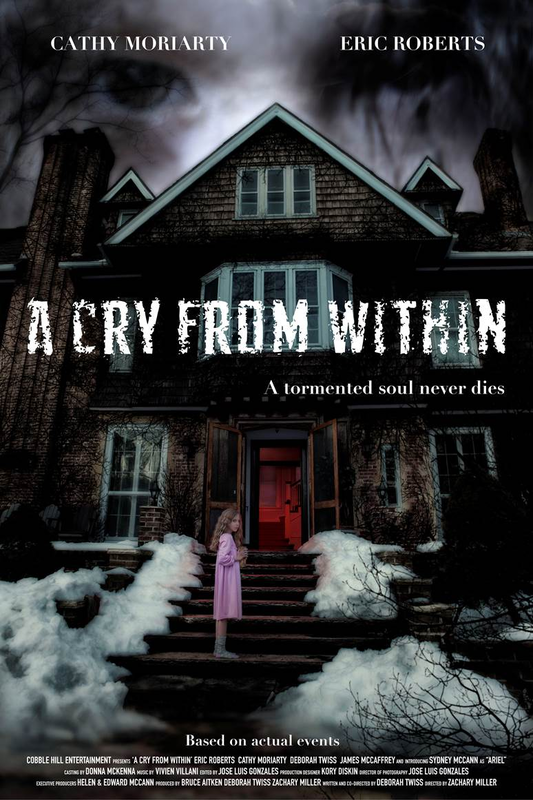 Some of A Cry From Within, in fact is spookily atmospheric, especially during the first half when the unknown presence inside the house begins to manifest itself in decidedly creepy ways…, although director Zach Miller doesn't lean heavily on jump scares, there’s a nifty one which takes place in the house’s dark basement that gave me quite a jolt. For much of the story, however, the film builds its atmosphere of unease using mood, suspense, and some welcome restraints where other filmmakers might have slathered on a bunch of noisy CGI nonsense…, with its lack of graphic gore and needless pyrotechnics, a welcome throwback to some of the subtle chillers of the 70’s and 80’s. A happy family meets a house with a truly demented secret, and all hell breaks loose…well, it’s a subtle, sedated kind of hell, but a hell nonetheless in A Cry from Within – the latest project from director Zach Miller …, (Eric) Roberts is fantastic in his role of Jonathan. Honestly, I’ve been a fan since the days of Star 80 so in my mind the man can do no wrong. Call it bias, but I call it unflinching support regardless of execution. Even in the most stressful of family emergencies, his character is as cool as the other side of the pillow and plays a beautiful part as the protective father, thus earning a gold star for his consummate work in the film. I was so engrossed in his undertaking that I nearly missed screen veteran Robert Vaughn as the doctor for the elderly Sophia…., In the end, A Cry From Within plays off much more as a tragic drama, regardless of the terrors that it hurls at you, and behind those frights is a sad view of a family gone horribly wrong from its origins.